No weekend cocktail party would be complete without appetizers. They are light, usually very tasty, and keep everyone pleasantly full without making anyone lethargic. The easiest way to prepare this sandwich is to buy frozen cooked baby shrimp. Defrost them in the refrigerator overnight and drain before marinating. The cucumber slices are salted before using to draw out their juices, which would otherwise make the sandwich soggy. Beat together butter, avocado, lemon juice, chili powder and salt in a bowl. In a second bowl, marinate the baby shrimp with lemon juice, olive oil, hot pepper sauce and salt to taste. Lightly sprinkle salt on cucumber slices and let sit for 20 minutes. Pat cucumber dry with paper towels. Cut bread in half. Spread slices with avocado butter. 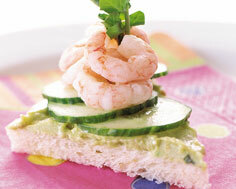 Top with overlapping cucumber slices and pile shrimp on top. Garnish with a watercress sprig. Repeat for remaining sandwiches.